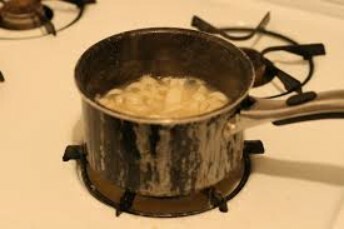 Did he or didn't he tell his wife he was cooking glue in her pot? Rawhide glue isn't difficult to make but it takes a bit of time and it's a tad messy. The glue itself is quite strong but it's water soluble so you have to be careful where you use it. Many years ago a Canadian bush pilot by the name of Wop May broke the propeller of his plane when he had to make an emergency landing. Not to worry! He shot a moose and made rawhide glue that was strong enough to repair the propeller and get him back to Edmonton. Simply scrape all the hair and the flesh from the hide in the usual manner and then, depending how much glue you're going to need, cut enough small pieces to half fill a cooking pot. The smaller the pieces you start with the faster the process. Cover with water, bring to a boil, lower the temperature and boil lightly for three or four hours. So that it doesn't burn, stir the pot periodically and add small amounts of water as needed. Eventually the pieces of hide will be gooey soft. At that point strain the liquid into a container and dispose of the bits of hide. Return the liquid to the pot and simmer until it's reduced to a glue-like thickness. There's no hard and fast rule, but consider that the more water it contains the longer it will take to dry when applied. The rawhide glue can be used right away, but you'll probably have made more that you need. To preserve the rest, pour it onto a flat surface like a plate. In an hour or two it will have cooled and congealed into a rubber-like disk. It will last quite a while if cut into small pieces and put into a container, but it is an animal product and will eventually go bad. If you want to preserve it longer spread it out on a cookie sheet to less than 1/16th inch thickness and let it dry completely. Then cut it into small wafers and store in a container. To use the dry glue re-heat in a bit of water and stir so it doesn't burn. The rawhide dog bones you can buy in any pet department make good glue. Put a few small rolls in a pot, boil until soft. Cut the softened rawhide into smaller pieces that are returned to the pot and follow the directions above.